The NB Southern yard in Saint John is their main yard and is known as Ponderosa Yard. From here, they interchange with CN in Saint John and send trains to Maine. Irving Forest Products shares the area. 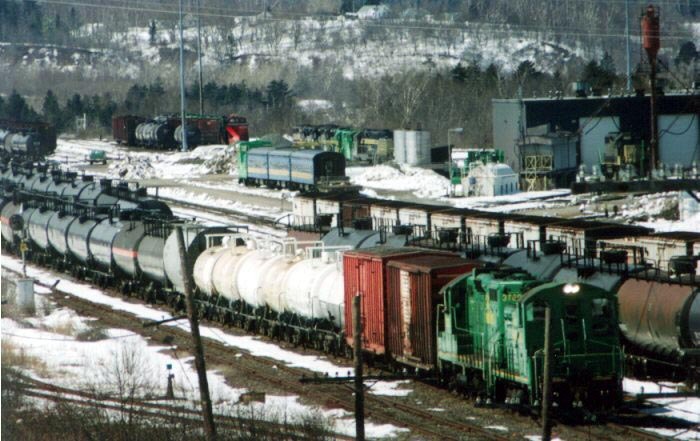 This is the former CP yard and runs the length of Dever Road in west Saint John. On this map, the yard is in the middle just above the words “Dever Rd”. Note that NB Southern is also currently leasing and operating CN’s Island Yard in Saint John. The engine house to the right. One of the leased units is in front. The business train in the center of the photo. The two rows of stored engines beyond the business train. This is a wider view of the yard. The white blobs to the right of the telephone pole are wrapped paper bundles from Irving Paper. Just on the right edge of the photograph is NB Southern’s engine house. I published a new book, “Passing a Half Century“. It’s available as a paperback book, on Kindle and as a PDF download. Buy it! Hi! I’m Steve Boyko and I am a photographer who specializes in trains and grain elevators. I like to tell stories through my photos and my blog. Join my mailing list to receive weekly photo emails and the occasional reminder of new blog posts! VIA’s Canadian – How Many Locomotives?